The Maury County Chamber & Economic Alliance, local business leaders and the Maury County Public Schools have teamed up to launch a strategic communications campaign intended to build stronger pro-education awareness, dialogue and relationships throughout the community. The campaign will bring attention and focus to educational success, in order to make Maury County the most competitive place to grow and prosper. Good things are happening in Maury County. Read the latest news about our schools and education. 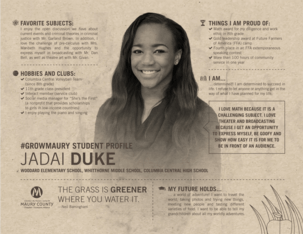 Learn more about a few of the bright, curious and courageous students in our schools who are well on their way to becoming tomorrow’s leaders. Click on the student image to meet them. These are exciting times to live and work in Maury County. In recent years, the county has become a leader of growth in the region as not only the fourth fastest-growing county, but also with a record number of job increases within the community. Encouraging new industry, great jobs, and a diverse tax base are key parts to keeping Maury County a vibrant and flourishing community. So how do we support this momentum and cultivate Maury County’s continued improvement? The Maury County Chamber & Economic Alliance is engaging the business community to help stakeholders throughout the community to play a positive, more visible and active role in making the school system strong. Your knowledge of this effort will help relay positive word-of-mouth and encourage others in the community – parents, businesses, residents and many others – to get involved in helping Maury County become the most pro-education community it can be. The grass is always greener where you water it. With your help, together we will carefully tend to each child’s educational experience so that Maury County can reach its greatest potential. Call the Maury County Chamber & Economic Alliance’s Education Task Force today: 931-388-2155. Want to stay informed? Sign up for our email newsletter or contact us to learn how you can help Grow Maury.